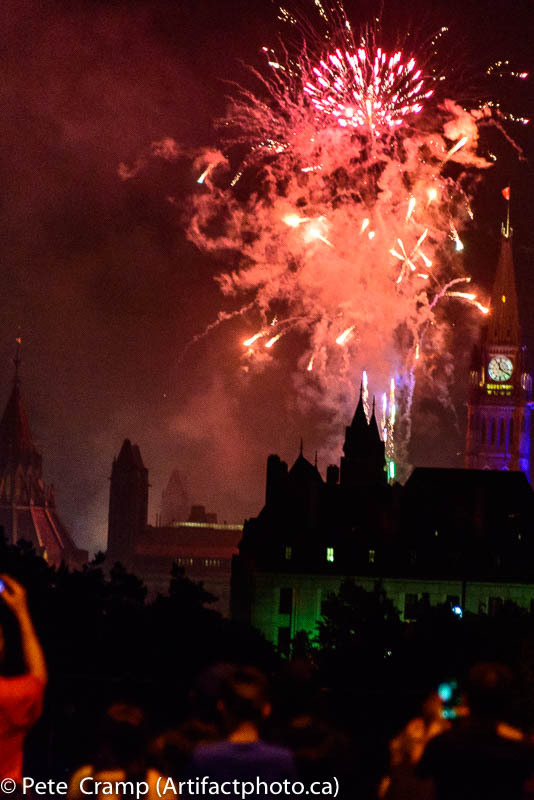 We go to Ottawa for the country’s 150th birthday bash. Happy birthday, Canada! Last year, we celebrated Canada Day (July 1) in Dawson City, Yukon. It was pretty cool and I wrote about it in my book, North to the Yukon. To show contrast, this year we headed to Ottawa for Canada’s 150th birthday. It seemed appropriate. The differences were incredible. Dawson City is a small town with a tiny budget and a lot of heart. They had a parade through town to the museum. There were speeches, music, cake and a free barbecue. Ottawa is a large city with a huge budget, and people were certainly into it, but the organization left a lot to be desired. All of the core streets were closed to traffic, so if you needed to drive in, you had to park at a commuter lot and take the free transit service downtown or find a parking spot within walking distance. We found just such a spot under the War Museum, just a fifteen-minute walk from downtown. The parking rate was relatively inexpensive, and admission to the museum was free on Canada Day, so we took a couple of hours to explore before walking over to Parliament Hill. The main venue for today’s events was on the front lawn of the Parliament Buildings. 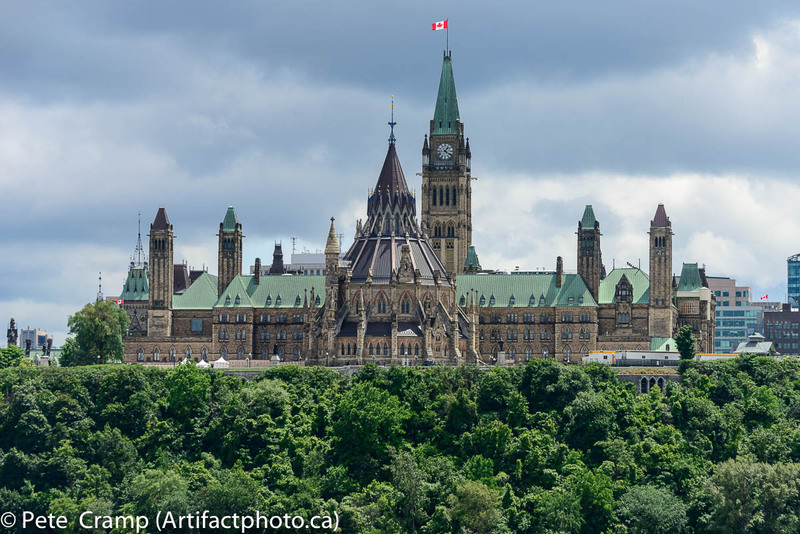 If you don’t know, Canada’s Parliament Buildings consist of three massive buildings situated around a huge square of lawn dominated by the iconic Peace Tower, sited on a hill overlooking the Ottawa River to the north, and the Rideau Canal to the east. Rideau Street forms the southern boundary of the square. On the lawn in front of Centre Block, a huge stage had been set up for an all-day series of concerts from various Canadian rock and country music performers. It promised to be a heck of a shindig. Due to security concerns, access to the site was restricted to two single lines at opposite ends of Rideau Street. Tens of thousands of people lined up for between four and six hours to get in. Once they got in, there was no food or drink available, so if they didn’t bring anything with them, they would have to go back out and buy something and endure the six-hour lineup again. The all-day concerts looked good, but we weren’t into waiting that long. We wandered the closed streets surrounding the site, watching the antics of the passersby, and sympathizing with the hopeful, yet somewhat dispirited crowd in the lineups. We checked out the new Bank of Canada museum, which was having its grand opening, bought some newly minted ten-dollar bills, and drove the hour back to our campsite for supper. As we lit a cooking fire, the rains came. Donna kept the steady pour of water off of the fire by standing over it holding a golf umbrella while we cooked. It looked comical, but it worked. We were thrilled we weren’t on the front lawn of the Parliament Buildings in that downpour. After supper, the rain stopped, and just before 10:00 pm, we started back into the city for the fireworks which were scheduled to start at 11:00 pm and last 20 minutes and 17 seconds. We parked at the National War Museum and found a spot out front where we could watch all five fireworks launch sites. Luckily for us, the fireworks were delayed a few minutes due to a delay in the concert schedule, so when we sat we got the full effect. The main launch site was at the Museum of History (formerly the Museum of Civilization). A dramatic display of firepower was launched from there over the Ottawa River. Additional sites in Gatineau, on Parliament Hill, and near the National Gallery provided a broad canvas of light. It was pretty spectacular, although I’m not completely sure if the viewers who made it into Parliament Hill got the full effect, as the main display appeared to be behind the Parliament Buildings and the massive stage that had been setup on the front lawn. A friend of mine watched from the Alexandria Bridge, which overlooks the Museum of History and the Parliament Buildings, and reported that the view was awesome. Our location, up-river about a kilometer, was slightly distant but gave a nice, wide view of the entire capital. Mortars exploded high in the sky in a panorama of light, occasionally silhouetting the Parliament Buildings and occasionally obscuring them behind clouds of smoke. It was a beautiful end to a special Canada Day.